Cranky Old Grannykat’s parenting advice. Stop driving yourself a bit crazy trying to be a happy parent raising happy children. Settle for staying sane enough to keep your children alive and making them moderately obedient. Not true. Newborns are happy when sleeping. Well, maybe content and minimally not torturing parents. Newborns are designed to introduce parents to a harsh fact of parenthood – loss of control. A major Emotional Fitness Skill is knowing what you control and what you do not control. Now I know one or two babies are born happy souls and little bothers them. They eat, burp, sleep. These lead to sanctimony in the lucky parents, and false hopes in the other 99% of parents. This post was prompted in part by reading a book title promising that you could have a happy baby if you just followed their advice. Sigh. And it is a best seller. Another sigh. My reality based Parents Are People Too is far from a best seller. Hope sells better than reality. There is another new best seller about the horrors of becoming a parent. Sympathy also sells and that book is a sure sign the pendulum is swinging back toward reality but it still misses the mark. Parenthood is both hellish and heavenly. I was lucky, I was raised before it was thought happiness was a child’s right and a parent’s job to assure that happened. Created some little kings and queens who entered adulthood with false expectation and not enough “go along to get along” skills. The human race is lucky that keeping kids always happy just is not possible, so most adults have acquired enough “go along” skills to adjust when reality begins to slap them around. I want the parenting pendulum to hit center. Parenting is often a thankless, nerve-wracking, dirty, hellish job. And the emphasis on happiness is not helpful. At the same time, all the pain eventually pays off. Maybe after you become a grandparent but hopefully long before even the terrible twos are reached. Here are my parent tips for hitting the middle between happiness and teaching your kids to deal with reality. Tip one: The younger your child, the less control you have over the child’s feelings. 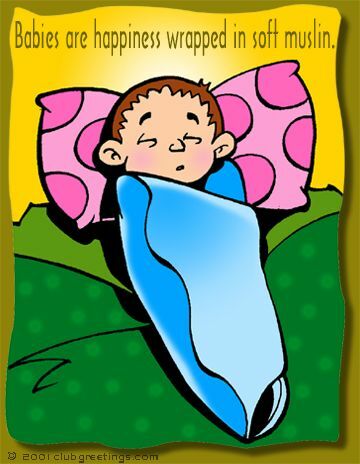 Anyone who has lived with a colicky or difficult baby knows that reality. In the long run that puts you ahead of the game, but only if you don’t take child’s unhappiness personally. Tip two: Reframe a child’s unhappiness. S/he is learning about life. S/he is being emotionally toughened for the battles ahead. Tip three: Enjoy every peaceful moment you can. One of my kids was what some would classify as difficult. I learned to spend a few minutes each night before I went to bed watching him sleep and savoring the quiet. Doing so kept my love flowing. I also learned to sleep when they became teens and early adulthood by reminding myself it the phone was not ringing loudly in the middle of the night, most likely all was well. Tip four: Hold reasonable expectations. “Blessed are they who expect nothing for they shall not be disappointed” guided me through all my adulthood. I expected a hard row, but was also happily surprised when life was good. Tip five: Practice all the skills I describe in my Parents Are People Too, An Emotional Fitness Program for Parents. Here they are in an EFT Poster Coach. 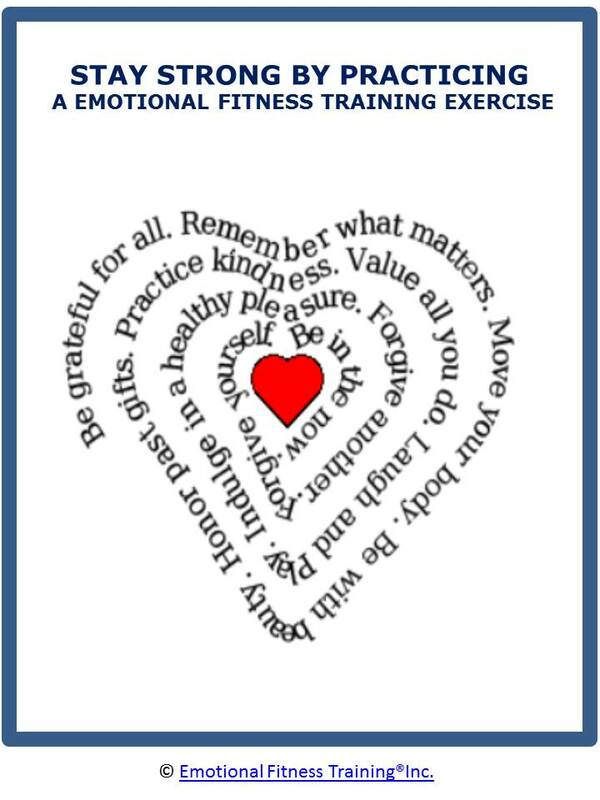 This EFTI Poster reviews the Daily 12 Emotional Fitness Exercises. Life as a parent is probably the hardest job in the world. Count your blessings for every good moment you can savor. Here is my thank you or welcome to the my blog gift – a quick introduction to The Daily Twelve Emotional Fitness Exercises. For a more details about staying strong as a parent by my Parents Are People Too book. It is available on kindle and you don’t need a kindle to read it. You can download a free Kindle readerto your computer when you buy the book. If you read it and like it, please help me by reviewing it. This entry was posted in Parenting Issues and tagged Emotional fitness, Emotional Fitness Training, Emotional Health, Happiness as a parent is a myth, Katherine Gordy Levine, Parenting advice, Parents Are People Too, postaday, Self care, Thinking about what matters. Bookmark the permalink.